As in other tropical parts of the world, banana and plantain (Musa sp.) are widely grown in India too. This fruit has great socioeconomic significance, interwoven in the cultural heritage of the country. Banana is fourth most important food crop in terms of gross value exceeded only by paddy, wheat and milk products and forms an important crop for subsistence farmers. It is also dessert fruit for millions apart from a staple food owing to its rich and easily digestible carbohydrates with a calorific value of 67-137/100g fruit. Being a rich source of vitamin C and minerals, it makes healthy and salt-free diet. In India, banana contributes to 31.72% of the total fruit production. India is the largest producer of banana in the world. Andhra Pradesh, Assam, Bihar, Gujarat, Karnataka, Kerala, Madhya Pradesh, Maharashtra, Orissa and West Bengal are major banana-growing states, the highest productivity being 52.18 tonnes/ ha in Maharashtra followed by Gujarat (40 tonnes/ ha). The lowest productivity is from the north-eastern region. Banana is well-suited for cultivation from humid subtropical to semi-arid subtropics up to 2,000 m above mean sea-level. In India, it is successfully grown from 8 N to 28 N latitudes with a temperature of 15 -35 C and a rainfall of 500-2,000 mm/ year. At higher altitude, banana cultivation is restricted to few varieties like ‘Hill banana’ which can be grown successfully without any deterioration of quality and specific aroma. Bananas grown under mid-subtropical conditions have better quality fruits, as they develop better aroma with crisp pulp. Mean temperature of 20 -30 C is optimum for its growth. Its growth declines with increase of decrease in mean temperature. If bunch emergence coincides with low temperature, it results in inflorescence emerging through pseudo stem. Chilling temperature results in similar malformed bunches. Temperature above 36 -38 C causes scorching effect with increased transpiration. High temperature in combination with water stress cause loss in growth. Water stagnation in poorly drained soils also leads to slow growth. The plants collapse in extreme cases. Apart from temperature and water, wind poses a major constraint in banana production. High wind results in uprooting and collapse of plants. Avoidance of bunching during the period of high wind velocity is advocated through adjustment in time of planting. Banana can be grown in all kinds of soils having good drainage. In sandy loan sol plants grow faster compared to vertisol or clay loam soil. Thought soil pH of 6.5-7.5 is optimum, banana can be grown in soils having a pH up to 8.5 with suitable amendments. More organic amendments are essential in sandy as well as heavy soils. Returns/unit area. Poovan is another important banana grown widely due to a wide range of adaptability and tolerance to many biotic and a biotic stresses. Rasthali is significant in commercial production, especially for excellent-quality fruits. Nendran is an important banana in Kerala and Tamil Nadu. It is the leading commercial cultivar contributing cultivar contributing to 58% of the total production owing to its high yield, ability to withstand strong winds, short crop cycle, and goods response to micro-irrigation and high economic returns/units area. It is being cultivated in Maharashtra, Madhya Pradesh, Gujarat and Bihar. It possess female and persist ant male bracts with flowers. Fruits are yellowish-green or yellow in tropics and in subtropics with brownish dots spread all over them. Several superior clones are under advanced stage of evaluation. Gandevi selection known as ‘Hanuman’ or Padarse is gaining popularity despite having longer crop duration. The selection produces bunches weighing 55-60 kg and performs better under light soil condition with higher inputs. It is a semi-tall sport of Dwarf Cavendish and is an important cultivar in Karnataka, Andhra Pradesh and Parts of Maharashtra. The plats bear bunches weighing 25-30 kg each with good-sized slightly curved fruits. Plants take approximately a year to complete their life-cycle. Like Nendran it is freshly planted every year. Propping requirement makes the crop investment. It is highly susceptible to sigatoka leaf spot limiting its cultivation in humid areas but is resistant to Panama wilt. It is tall mutant of Dwarf Cavendish. It is gaining popularity among the growers in Maharashtra and Karnataka. Plant characters resemble with Dwarf Cavendish except for its robustness, well-spaced hands, and fingers of bigger size and heavy bunches. It bears bunches weighing 25-30 kg with uniform long fingers throughout the bunch. However, it requires propping unlike Dwarf Cavendish. This is the choicest table banana for its tasty, crisp, good sour-sweet blended and pleasant flavoured fruits. Plant is medium-statured. Crop takes about 13-15 months to come to harvest with bunches weighing 15-18 kg each. It has about 6-7 hands with bold, stout fruits, turning golden-yellow on ripening. Hard lumps and fruit cracking are the major physiological disorders. Poovan is a popular cultivar grown all over the country in a perennial cropping system. It is the leading commercial cultivar of southern and north-eastern states. It is distinguished from other cultivars by its pink pigmentation on the ventral side of the midrib when young. It bears heavy bunches weighing 20-24 kg each with closely packed short and stout fruits having a conspicuous beak. The fruits/bunch vary from 150-300. Though fruits are slightly acidic and crop duration is 16-17 months, its ease of cultivation and hardiness make Poovan a popular cultivar. However, it is severely affected by banana-streak virus. Nendran is the most prized cooking variety used in Kerala, fetching a premium price during festive occasions. The banana products exported till date to the Gulf countries are only made from Nendran. It is also being cultivated in Tamil Nadu. Plant is slender with distinct pigmentation in younger leaves and pink shade on the pseudo stem. Male axis is not naked but is covered with persistent male bracts and flowers. Bunch weight varies from 8 to 15 kg with 39-50 fingers/bunch. Fruits have a distinct neck with thick green skin turning buff-yellow on ripening. The fruits remain starchy even on ripening. A number of ecotypes of Nendran, viz. Zanzibar, Otta Moongil, Moongil, Kali Ethan, Valiettan, Manjeri Nendran, Chengalikodan, Nedu Nendran, Chenganacheri Nendran, Attu Nendran, Myndoli and Padali Murian-are known. Having on an average 60 stout fruits/bunch. Fruits have a very good keeping quality. Pulp is not so juicy but rather dry and sweeter. It is grown mainly under perennial system of cultivation on the hills of Tamil Nadu and Karnataka. 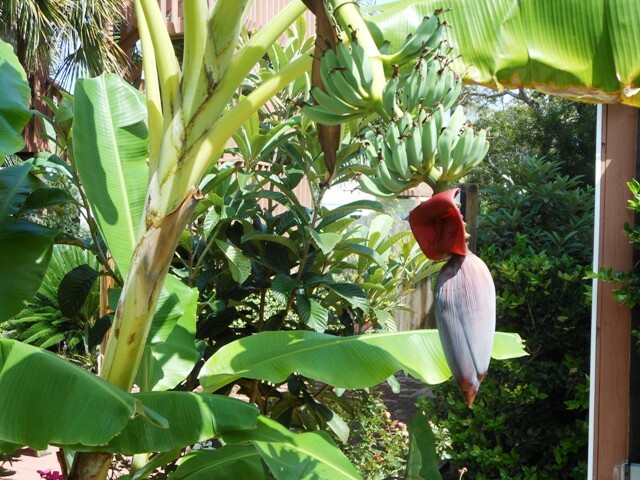 An elite banana, it is grown for red-skinned, delicious fruits. Its pseudostem is bold, robust and 2.5-3.0 m tall. The male axis is also pigmented. It has 5-8 persistent male flowers, hands followed by a bare fertile axis. It is a shy-yielder, bunches weight 20-22 kg each have 70-90 fruits. It has long duration of cropping (16 months). This cultivar was grown only in backyard gardens. Of late, it is cultivated commercially in Kerala and Tamil Nadu. It is fairly tall and robust, growing to a height of 2.5-3.0 m. Stem is yellowish-green without pigmentation and very shiny. Inflorescence is bold and hangs parallel to the pseudostem. Since male flowers and pseudostem piths are highly relished as vegetables and owing to heavy-yielding capacity, this culinary variety till now restricted to backyards has entered into commercial cultivation in Tamil Nadu, Kerala, Andhra Pradesh and Orissa. Its bunches weight 18-20 kg each bear 60-70 fruits which are bold, stocky, knobbed and pale-green. A few allied members of Monthan are suited for making chips. Once, a delicate backyard cultivar of choice, it now assumes commercial monoclonal cultivation. Elakki Bale occupies large areas in Karnataka under cultivation. It is a slender, medium-tall banana taking 12-13 months for its crop cycle. The bunch orientation is horizontal. Average bunch weight is 18-20 kg with small fruits packed closely having a wind-blown appearance. Flowers are pink. Stamens have pollen and style is bent. Pulp is ivory-coloured, firm, sweet, having good aroma with conspicuous ovules. Fruits have good-keeping quality. It fetches double the price than other cultivars. It is a hardly crop and is getting popular in marginal soils. Tolerances to drought, salt and wind, ease of cultivation and high productivity have favoured its commercial cultivation in Tami Nadu and other states. Its plants are about 3.0 m tall, robust with light pink-streaked pseudostem. It takes 16 month to harvest, bearing bunches of 25-35 kg each. Fruits are neatly arranged with a spring like geometric orientation. Very sweet fruits are conspicuously ash coated, beaked and do not drop off when ripe, making it suitable for long-distance transportation. With its suit ability for juice and wine –making, it has a better future. Besides, Matti Amritsagar, Dudhsagar, Sakkai, Chakia and Monohar bananas are also under commercial with regional preferences. A promising hybrid for subsistence cultivation, it has medium to high resistance to leaf-spot, fusarium wilt and burrowing nematlde. Medium-tall in height, its plants bear 14-16 kg bunch without propping. Elongated fruits turn attractive golden –yellow on ripening. Slightly acidic nature of fruits vanishes upon full ripening with high sugar content. It has a remarkable early-ratooning ability completing 4 crop cycles in 3 years. Multi locational trials have shown it’s accept ability among growers and consumers especially in humid areas. It is a medium –statured banana, growing 2, 13-2.44 m. Crop cycle is short with bunches coming to harvest in 11-12 months. Average weight of the bunch ranges from 15-20 kg with short, stout, dark green Poovan like fruit which are arranged very compactly. Fruits are slightly acidic with pleasant, sweet-sour aroma. It is a promising pome hybrid. It retains the typical acid/apple flavour of Virupakshi even when grown on plains contrary to Virupakshi which develops aroma only when grown at higher altitudes. However, it commercial adoption has remained due to small-sized bunch and low fruit yield. The hybrid belongs to Pome group with genomic constitution of AAAB. It is a potential commercial banana. It is resistant to Sigatoka and wilt, producing bunches weighing 18-20 kg each. Fruit quality is comparable with Pachanadan. Thus, this hybrid appears to be the best alterative to Pachanadan. In traditional growing regions, homestead cultivation of banana is common. The choice of cultivars is governed by family requirements and quality preference of the household. Backyard cultivation because of the ease in establishment, availability of area around farmhouse, minimum capital investment, ease of monitoring and sharing of lab our among family members. Homestead farming is characterized by improper spacing, inadequate use of fertilizer and pesticides, high productivity and longer crop duration. In coastal regions of Karnataka, Kerala and Andhra Pradesh, banana is grown in coconut and arecanut plantations with tall cultivars. Apart from these palm crops, banana plantation with ginger turmeric, elephant-foot yam, cotton, gourd and other vegetables to exploit maximum income/unit area. It is commonly followed in coastal plantations of Karnataka and Kerala where crops with different canopy levels are planted. High density planting with coconut and arecanut forming the upper storey followed by banana, next with tapioca and lower-most storey with colocasia, turmeric, ginger and garlic. High input management is its important feature. Semi-tall banana Poovan and Ney Poovan are preferred in this system. Banana is propagated through suckers or corms. Sword-suckers with a well-developed rhizome, conical in shape with lanceolate leaves and actively growing central buds. Weighing 500-750 g is generally used. In western and central Maharashtra, well-developed rhizomes with dormant lateral buds and ‘dead’ central bud are used. Apart from these, cut rhizomes called ‘Bits’ and ‘Peepers’ are also used successfully. Time of planting is determined by the choice of cultivar, agroclimatic condition and market demand. Sigatoka-susceptible banana Dwarf Cavendish, when grown in humid region, by adjusting time of planting, bunch emergence in rainy season is avoided. In subtropical conditions, planting time is adjusted to avoid shooting in winter season. However, in tropical conditions shooting during high wind time is avoided by adjusting time of plating. Time of planting for long duration cultivars is different from short duration ones. In Tamil Nadu, banana Dwarf Cavandish and Nendran are planted from February to April, while Poovan and Karpuravalli in November-December. In Maharashtra, there are 2 distinct seasons of planting, i.e., September-October and June-July. With the adoption of drip irrigation and fertigation, shooting is advanced, thus time of planting is adjusted accordingly to meet market demand. Tall-growing varieties are plated 2.0-2.5 m apart and wider spacing is also followed in plantations identified for leaf purposes. Commercial banana Poovan, Rasthali, Nendran and Robusta are maintained at 2.1m x 2.1m spacing, while dwarf cultivars Dwarf Cavendish, Kullan and JawariBale at 1.8m x 1.8m. 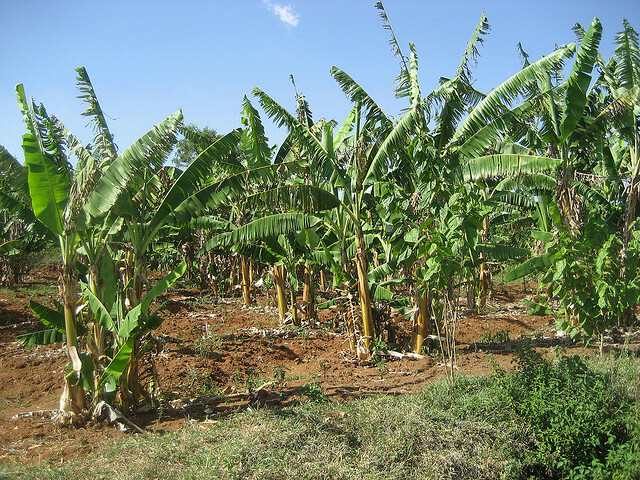 High-density planting in banana has gained popularity. The planting densities for different cultivars are given in Table 2. With the adoption of drip irrigation, double-row system of planting is largely followed in Maharashtra. In this system, 2 rows are planted closely with wider space after every 2 rows. This system reduces cost on dropper, facilitation cultural operations. High yield/unit is an added advantage. Depending on tradition, resource availability and existing constraints planting systems vary in different regions. Pit planting is commonly followed in garden land system of cultivation. Pits of 60 cm x 60 cm x 60 cm size are dug, filled with a mixture of soil, sand and farmyard manure in a 1:1:1 ratio. Suckers are planted in the centre of the pit and soil around is compacted. This is mostly followed in biennial plantations for Dwarf Cavendish, Rasthali, Robusta, Poovan and Karpuravalli banana. In Gujarat and Maharashtra, furrow planting is practiced. After land preparation, 30-40 cm deep furrows are made, either manually or with a ridger. Suckers are placed at required spacing, farmyard manure is applied around, mixed with soil and tightly packed round the suckers. This facilitates reduction in cost of pit opening incurred every year. Furrow planting is practiced in annual planting system. Trench plating is practised in wet land cultivation of Cauvery delta region of Tamil Nadu. Land is prepared like paddy using plenty of water and guage wheel. Water is drained from the field allowing to set for a day. Planting is done by simple pressing the suckers into the wet field. After a week 15 cm deep trenches are opened both ways maintaining 4 or 6 plants in each block. Deepening of trenches by 20-25 cm is taken up every month after planting till suckers put forth 1-3 leaves. During third month trenches are broadened and deepened to 60 cm. In rainy season, same trenches are used for draining out excess water. Trenches are also used for dumping cut plants, suckers and leaves for decaying for decaying under anaerobic conditions. After about 2 month, trenches are cleaned decayed manure is used for plants for organic recycling. Banana being heavy feeder requires very large quantity of nutrients for growth and yield, accounting for 20-30% of the total cost of production. Choice and quantum of fertilizers, time of application, and mode of application and frequency of application vary depending upon cultivar, production system and agroclimatic conditions. All the macro-and micro-elements are required by banana. Their requirement, however, depends on their function and availability. Among macronutrients, N is most essential element. For normal plant growth and development 100-250 g of N/plant is advised depending on nutrient status of soil and cultivar. Urea is commonly used as a source of N. It should be applied in 3-4 splits. Application of 150g N in vegetative phase and 50 g N in reproductive phase enhances the yield and delays the leaf senescence. Application of 25% N as farmyard manure and 1 kg neem cake is beneficial. The application of 25% N in organic form, 75% N in inorganic form along with growing of green manure crops like Crotalaria is ideal. The P requirement of banana is comparatively low. Super phosphate forms the major source of P followed by the application of rock phosphate 50-95 g/ plant at planting. In acidic soils, triple super phosphate or diammonium phosphate is recommended. Phosphorus is applied in single dose at the time of planting and quantity of P2O5 depends upon soil type and varies from 20 to 40g/plant. split during vegetative phase and 100g in 2 splits during reproductive phase is recommended. Application of 200-300 g K2O is recommended depending upon cultivar. Invariably, plantains require higher K than other group of cultivars. Muriate of potash is invariably used as source of K. But in soils with pH above 7.5, potassium sulphate is advantageous. Fertilizer recommendations for bananas in different states are given in Table 3. Calcium influences yield through its interaction with N, P and K. In acidic soils, use of dolomite (MgCO3) and limestone (CaCO3) as soil amendments is common. Magnesium, an important component of chlorophyll assumes a vital role in normal growth and development of the plant. In acute deficiencies foliar spraying of MgSO4 is found to relieve the plant. In acute deficiencies foliar spraying of MgSO4 is found to relieve the plant. Although widespread sulphur deficiency in soils has been reported, but is but serious in banana. Sulphuruptake is active during sucker to shooting stage but after shooting, sulphur supply comes from leaves and pseudostem among micronutrients, Zn, Fe, B, Cu and Mn play an important role in normal growth and development of banana. The application of Zn (0.1%), B (0.0005%) and Mn (0.15) improves yield. Important symptoms of mineral deficiencies in banana are given in Table 4. Depending on water availability, banana is grown either as rain fed or irrigated or wetland crop. Most of the AAA and AAB clones are grown under irrigation conditions, while ABB clones are raised as rain fed crop. However, in commercial cultivation irrigation is a major input. Water requirement of banana varies from 1,800-2,200 mm. Nendran, Robusta and Dwarf Cavendish bananas should be irrigated at 20-40 cumulative pan evaporation (CPE), while Poovan at 60 CPE and Karpuravalli at 80 CPE. Soil-moisture stress at active growth stage and finger filling has deleterious effect. Normal furrow and basin and trench systems are followed. The furrow or basin system is useful if water availability is not a constraint. Trench method is followed especially in wetland system of cultivation. Of late, drip irrigation system has become popular in Maharashtra and many other states where water is not plentiful. In drip system, water is supplied through laterals and discharges through emitters in the root zone. The system not only economizes the water by 40-50%, early harvest is achieved with higher yield/unit area. Use of fertilizer through drip (fertigation) also helps achieve high productivity. The fertigation is also becoming popular, wherein required quantities of nutrients are given through soluble fertilizer or liquid fertilizer. Flood irrigation is followed in garden land cultivation, where plenty of water is available. Temporary bunds are made around a block of 10-20 plants for convenience and irrigation is carried out block-wise. Weeds reduce yield up to 40-50% depending upon cultivar and soil. First 6 months of growth are most critical for weed growth. The plantation has to be kept completely weed-free. In garden lands of Maharashtra, bullock-drawn cultivators are commonly used in between rows to keep orchard weed-free. Regular hand weeding is essential. In wetland cultivation, turning of top soil to bury the weeds after complete wetting the field followed by no irrigation for 15-20 days is commonly followed to check weed growth for 2-3 months. Aparts from cultural practices, chemical control using 0.4% glycel spray is also effective. But an integrated management of weeds by intercropping cowpea, soil mulching with sugarcane trash and paddy straw and one spraying of Glycel is economical. Surplus and unwanted suckers should be kept under control for better growth and yield of the mother plant. Desuckering once in 45 days is a common practice in banana plantation of up to 2-3 months, emerging small suckers are simply headed back with a sharp knife. In later stages, removal along with their rhizomes is a must. For that a crow bar of 1m with a flattened, spoon like edge is used and care is taken not to damage the mother plant. Cutting back the sucker and pouring kerosene (4ml) into the small gouged cavity made in the centre or injection of kerosene from the side of the sucker just above the meristem can also be adopted. Setting a sucker for rationing is important to maintain higher productivity of the orchard. When three-fourths of the plats in the orchard are in flowering, one sucker is allowed and set for rationing. At one-and-a-half to 2 months stage the sucker is given a cut to chop the vegetative growth and allow the rhizome to enlarge. At the time of harvest, set sucker is ready for the ratoon corp.
As the young plants grow, and lower leaves dry, they are separated from pseudostem and fall apart. To avoid weakening of the pseudostem, it is a common practice to tie all the leaf sheaths with a dried banana leaf. This operation is done periodically at bimonthly intervals. Dried or diseased leaves are also required to be removed at regular intervals to reduce disease load and also to give exposure to sunlight. For maximum yield, a minimum of 10-12 leaves are required to be retained on the mother plant. Strong wind is a threat for successful banana production. Though planting season is carefully chosen in areas where strong winds are a routine menace, propping becomes essential for tall cultivars. Lodging of plants is due to the selection of weak suckers, shallow planting leading to poor anchorage, and damage by pests, diseases and nematodes, extra large bunches and removal of adjacent, deep-rooted suckers. Bamboo or Casurina poles are commonly used. These poles have effective life of 3-4 years. Props using polythene wire can also be practiced. Propping should be done immediately after bunch emergence to avoid overloading on the prop. Removal of male bud after completion of the female phase is referred to as ‘denavelling’. It serves the dual purpose of saving movement of food into unwanted sink and also earns additional income as it is used as vegetable. Bunch covering is practiced for Cavandish and Silk groups of bananas to get attractive colour. Under subtropical condition, covering of bunch by using perforated polythene bags increases the yield by 15-20% Covering bunches by dried leaves is also practiced to avoid direct exposure of peduncle to sun. Uncovered peduncle when exposed to sun is scorched and secondary infection of Colletotrichum causes poor filling of fingers. Harvesting of banana has no definite yardstick. In a polyclonal condition, harvest index varies a lot depending on the variety, proximity to the market and mode of transportation. But in general, based on number of days from flower emergence, pulp: peel ratio, weight: length ratio, disappearance of the angles, thumping sound of fruits, brittleness of the floral remnants and their natural shedding, dullness of the fruit skin colour and odour are used as index for bunch harvesting. Banana bunch development continues over a period of 90-150 days depending on the variety. Maturity standards mentioned are accomplished in Dwarf Cavendish in 113-130 days. Lower temperature delays maturity while higher temperature advances it. For long distance transportation, harvesting is done at 75-80% maturity. While harvesting and transporting, care should be taken, to avoid direct contact of fingers, which otherwise turn black on ripening. Ripening in closed chambers is widely practice in India. Bunches are dumped in ‘ripening rooms’. Ethylene is generated in a room to give uniform ripening. Smoking and use of acetylene are not good. An attractive colour in banana can be obtained by slow ripening under controlled condition (15 -18 C with lower ethylene concentrations). Small-fruited banana Poovan and Rasthali are wrapped with banana leaves while Robusta and Dwarf Cavendish are packed in boxes. High cost of boxes and their volume with increased freight charges do not encourage packed transportation of banana in boxes. Packing of hands or demanded fruits in polythene is promising. It is successfully demonstrated that 100 gauge polythene bags with 0.2 % holes enhance shelf-life under room temperature as well as in cold storage, while polythene bags without any perforation develop fungal infections due to high humidity. Of the post harvest treatments to delay ripping in banana are skin coating with waxol (12% wax emulsion) which prolongs shelf-life by 10 days. Dipping or spraying of bananas with a fungicide solution containing 400 ppm TBZ is effective in checking many post harvest diseases. Fungicidal wax coating is also effective in reducing weight loss, spoilage and delay in ripening. Banana leaf forms a healthy and hygienic eating plate. In south India, especially in Tamil Nadu, banana is exclusive grown for leaf production. It is estimated that, leaf industry has turnover of Rs 125 million annually. Ease of cultivation, regular income and high profitability make this an attractive venture. Poovan, Monthan and Karpuravalli banana are the major cultivars grown exclusively for leaf industry. Wide spacing of 2.6-3m allows 6-9 plants/clump. Plant crop is allowed for bunch while 2 ratoons are meant for leaf production leaving 4-5 leaves/plant for the production of small bunch. Rest are cut and marketed. Neer Vazhai is a malady of unknown etiology. It affects Nendran banana in Tamil Nadu. Infested plats show poor plant growth, delayed shooting, lanky bunch with few hands and immature unfilled fingers. Fruits ooze out watery fluid when cut, hence the name ‘Neer’ meaning ‘water’ and ‘vazhai’-‘banan’. In infested plants, severe root damage is noted. Cause of this disorder is not known but is of serious concern causing considerable loss. There are stray reports of this malady affecting ‘Poovan’ around Trichy in Tamil Nadu. Application of growth hormone NAA improves the finger filling. It is transmitted through suckers. Thus it can be suspected to be caused by virus or mycoplasma.